The Wolfpack gets together for one last time in Las Vegas - the city where it all began. With no wedding and no bachelor party, what could possibly go wrong? Yet all hell breaks loose as the city crumbles in mayhem. The Hangover Part III is the epic finale to the hilarious Hangover trilogy. $41.671 million on 3555 screens. Back in 2009, The Hangover became a legitimate out-of-nowhere smash, as it turned into the highest-grossing “R”-rated comedy of all-time. 2011’s Hangover Part II did almost nearly as well, so all involved came back to finish the “trilogy” with 2013’s The Hangover Part III. With a gross of $112 million in the US, it’d be tough to call Part III a genuine flop, but given the expectations set up by the first two films, it certainly offered a big disappointment. Part III made less than half of Part II’s gross and likely put a stake in the franchise’s heart. Sure, its creators claimed they intended it to end the series anyway, but I suspect stronger box office receipts might’ve changed their minds; since the flick disappointed in so many ways, I think we’ve seen the last of the “Wolf Pack”. At least this one shows some creativity compared to Part II. The latter was more remake than sequel, while Part III goes on a different path. In a prologue, we see gangster Leslie Chow (Ken Jeong) – a major complicating factor in the first two movies – escape from a Thai prison. From there we head back to the States to reunite with man-child Alan Garner (Zach Galifianakis) as he struggles to mature. The spoiled rich “kid” causes a major news headache when he purchases a giraffe and inadvertently decapitates it. Alan’s irresponsible behavior launches his father Sid (Jeffrey Tambor) onto a tirade that kills him; as he lectures his son, the elder Garner keels over from a heart attack. This seems to accelerate Alan’s slide and leads to even more out of control behavior. Eventually Alan’s friends stages an intervention and he agrees to go for treatment – as long as fellow “Wolf Pack” members Stu Price (Ed Helms), Phil Wenneck (Bradley Cooper) and Doug Billings (Justin Bartha( go there with him. They take a road trip that leads to complications due to their connection to Chow. It turns out that Alan corresponded with Chow while the latter resided in jail and may know where Leslie currently hides. Mobster Marshall (John Goodman) abducts the “Wolf Pack” guys and demands that they find Chow because Leslie stole from him. If they don’t bring back Chow so Marshall can reclaim his money, he’ll kill Doug. Crazy shenanigans ensue. As you may note, that synopsis offers no mention of any hangovers in The Hangover Part III. That may seem odd, as the prior stories were built around misadventures caused by excessive intoxication. Is a hangover-free Hangover story a logical extension of the franchise? In my opinion, yes. As I mentioned, Part II often felt like a regurgitation of the first film; though I actually enjoyed it more than the debut, I can’t claim it did anything especially original. It stretched credulity to make the same guys experience the same sorts of events a second time; a third movie in which the guys get blotto, do inappropriate things and have to retrace their steps would've been tiresome, so I’m glad Part III went in a different direction. Though some other aspects of it might seem too different to many fans. While the first two focused on the three members of the “Wolf Pack”, Stu and Phil often feel like afterthoughts here, and the supporting character of Chow becomes a lead. That creates an unusual balance that may seem out of whack to fans. Since I was never much of a “fan”, though, the change doesn’t bother me, and I must admit I think the end result works fairly well. Many fans hated the flick, so I might be the only one, but I thought Part III was moderately enjoyable - not great, but a lot better than its reputation indicates. Honestly, I think the series improved as it went along. As I noted, I didn't like much about the first one, and I wasn't wild about the first sequel, but I felt it improved on the original. For me, Part III becomes easily the best of the bunch. It largely dispenses with the cheesy gross-out humor of the first two, and without the “hangover” conceit, it enjoys a thematic and comedic freedom absent from the others. It really is a fairly substantial departure from the first two, and maybe that's why a lot of people dislike it. Like I said, the gross-out humor's gone, and we get a lot more subtle gags. I'll always prefer small jokes over broad ones, so that makes Part III more appealing to me. While it still comes with some pretty wild bits, it provides a lot of comedic asides that don't call attention to themselves, whereas the first two tended to go for "in your face" moments. I like the more subdued feel of Part III - well, subdued for a Hangover movie – and feel it comes with a reasonable number of laughs. I continue to feel sorry for Justin Bartha, though. As seen in the National Treasure flicks, he has good comedic talent, but he's stuck with a dud role in all three of these movies. He's a plot device, not a character, and the role wastes his skills. The Hangover Part III never threatens to become a comedy classic, but it kept me interested and entertained across its 100 minutes. It certainly amused me more than the first two combined. 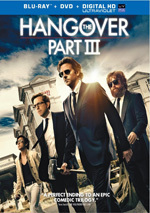 The Hangover Part III appears in an aspect ratio of approximately 2.40:1 on this Blu-ray Disc. Across the board, this was an appealing transfer. Sharpness always looked strong. No signs of softness marred the presentation, as it gave us a tight, well-defined image. Jagged edges and moiré effects remained absent, while edge haloes and digital noise reduction also failed to appear. Print flaws stayed absent as well. In terms of colors, stylized tones dominated. These varied dependent on location and situation; they ranged from amber to teal to orange to green and other hues. These fit together better than one might think and looked fine. Blacks were dark and tight, while shadows showed nice clarity and smoothness. I felt this was a consistently strong image. While I expected “A”-level visuals, the activity level of the film’s DTS-HD MA 5.1 took me by surprise. With a fair amount of action on display, the mix used the five channels in an involving manner throughout the majority of the film. This meant cars, gunfire and other mayhem all around the room, and the elements connected in a concise, smooth manner. Add to that music as a bold partner and the soundscape turned into a more aggressive experience than I anticipated. Audio quality always satisfied. Music was dynamic and full, and effects followed suit; those components came across as accurate and wel-developed. Speech seemed distinctive and crisp, without edginess or other issues. I didn’t think I’d get such a terrific auditory experience from a Hangover film, but this one earned a solid “A-“. We don’t get a ton of extras here, as we mainly find short featurettes. A comedy piece, Replacing Zach: The Secret Auditions runs six minutes, nine seconds and offers comments from director Todd Phillips and actor Zach Galifianakis. The show sets up the notion that Phillips wants to replace Galifianakis for Part III. It’s a gag, of course, but it’s moderately enjoyable to see fake screen tests. Under The Wolfpack’s Wildest Stunts, we find a five-minute, 10-second with notes from Galifianakis, Phillips, producer Dan Goldberg, stunt coordinator/second unit director Jack Gill and actors Bradley Cooper, Ed Helms, and Ken Jeong. They discuss some of the film’s action elements. A few decent notes emerge, but the program tends toward fluffy hyperbole. One of the actors shows up for Zach Galifianakis in His Own Words. In this two-minute, 32-second segment, Galifianakis throws out a mix of goofy thoughts about his life and the movie. It’s nothing special but it offers moderate amusement during its brief running time. Pushing the Limits lasts three minutes, 36 seconds as it includes remarks from Phillips, Goldberg, Cooper, Jeong, Galifianakis, and visual effects producer Robert Stadd. The show covers the film’s scenes with animals and children. Though fairly superficial, it tosses out a smattering of good details. Another jokey clip, Inside Focus: The Real Chow fills five minutes, 24 seconds with notes from Jeong, Galifianakis, Cooper, Phillips, Goldberg and actor John Goodman. “Focus” tells us that Chow is real and Jeong is a fake identity. Mild amusement results. Under Action Mash-up, we get a one-minute, nine-second clip. This simply takes a bunch of the film’s violent moments and packages them together. I can’t say it does anything for me. Since similar compilations appeared on the first two movies, though, someone must like them. Three Extended Scenes last a total of two minutes, three seconds. With an average of 41 seconds per scene, one shouldn’t expect them to be extended much. They’re short and inconsequential but still fairly amusing. Finally, a collection of Outtakes goes for seven minutes, 51 seconds. It mixes bloopers and alternate lines, a combination that makes it more appealing than more collections of this sort. The disc opens with an ad for We’re the Millers. No trailer for Part III shows up here. A second disc provides a DVD copy of the film. It features none of the Blu-ray’s extras. Most won’t agree, but I think the franchise goes out on top with The Hangover Part III. With a different focus and feel, the movie becomes the funniest of the bunch. The Blu-ray delivers excellent picture and audio but doesn’t boast a great roster of bonus materials. It’s too bad the disc skimps on extras, but the movie itself entertains.